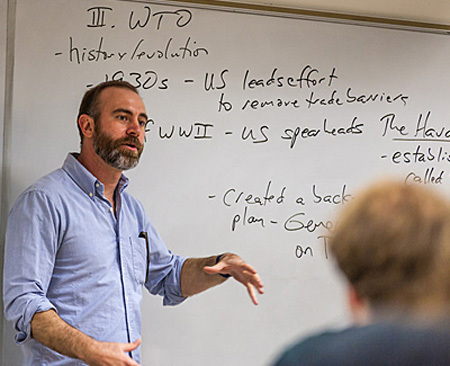 Government professor Jason Brozek will teach the course “9/11 in Context: Terrorism as Lived Experience” as part of Lawrence’s new “D-Term” this December. The course includes a trip to the 9/11 memorial and museum in New York City. The term will feature 18 new Lawrence courses ranging from an introduction to the art of making books, to the political and cultural forces that shape what we eat, to an exploration of how neurobiology, genetics, physiology and ecology direct animal behavior. The D-Term also provides opportunities for students to enroll in one of several non-Lawrence courses. Students enrolled in a CNA training or medical terminology class offered through Fox Valley Technical College can receive credit from FVTC, but not from Lawrence. An intensive business fundamentals course designed to immerse students in the fundamentals of business and build upon the necessary skills and behavior for success in today’s 21st century global workplace will be taught by faculty of the Fullbridge Program. This will be offered as a non-credit class. Available only to current students, the classes will be conducted the first two weeks of December (12/1-12). The Lawrence courses will provide three units of credit toward the required number for graduation. Classes will be conducted each weekday, with some involving weekend work. Class meeting times will vary during the day. Each course will require at least five students to be conducted and students will only be allowed to register for one D-Term course. If a particular course does not meet the enrollment minimum, students will be able to sign up for a second course. Registration for D-Term courses begins Sept. 15 with the start of Fall Term classes. Complete details on the D-Term are available here.